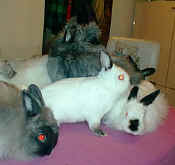 We "aquired" Sheleg when we went to a rabbit show in Berea, Ohio. I wanted to go the show since I had never been to one and I really wanted to see what went on there. As we came in, a woman was sitting on the floor near the door and was grooming her Jersey Woolies and I commented how cute they were and that I had 2 at home. She asked me if I wanted another one for free. I asked why she was giving it away and she told me it was because he had 1 white claw and was not showable. I explained that I was really not looking for a rabbit and walked away. 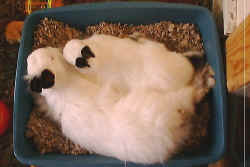 While I was looking at the Angora's, my husband comes walking up to me and he is holding this White Jersey Wooly rabbit. When I asked him what he was doing he said that the woman just handed it to him and said here "take it". My husband said he felt so sorry for the rabbit and wasn't sure what else this woman might have done with it that he figured 1 more rabbit couldn't hurt and he felt so bad for the rabbit that he decided he couldn't leave it behind! 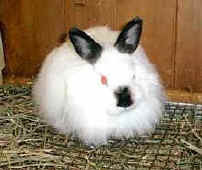 Oh Yeah...the name Sheleg...in Hebrew it means snow and since I already had a bunny named snowflake, Sheleg it was! Sheleg found a permanent home with someone I work with. He now has a bonded bunny friend to live with forever.